Though I posted Murg Polau / Morog Polau / Chicken Pilaf recipe before, I wanted to do it again. In restaurants of Bangladesh Murg Polau / Morog Polau / Chicken Pilaf has its different style. They don’t mix the gravy with rice. They just top up chicken / morog on rice. Don’t get shocked to see the list of ingredients. Most of ingredients are available in Bangladeshi kitchen. Hope you will make it and enjoy it. HAPPY NEW YEAR TO All my readers. 1. Cut the chicken like the picture. Cut each chicken into 4 pieces and cut 1-2 slits on each piece. 2. Clean and wash well. Pat dry it and mix lemon juice and1/2 tablespoon salt. Keep it aside at least for ½ hour. 3. Wash the rice and place in a strainer. 4. Heat the pan with oil and butter on medium and fry the onion till it becomes golden brown. Remove the fried onion from oil. 5. 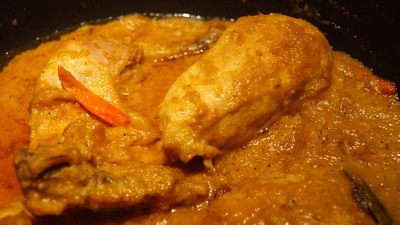 In the same oil fry the chicken pieces and fry till it changes the colour and become light brown. 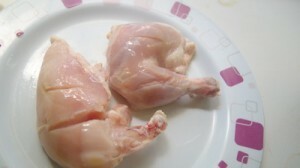 Remove chicken pieces from oil. 6. In the same pan add 2/3 of fried onion. ½ tablespoon salt and all the spices (except green chillies, sugar, sultana and cashew nuts) and cook it till oil comes out. 7. Add chicken and yogurt. Mix well and cook it about 5 minutes. 8. Add milk and cook it under closed lid till chicken becomes tender. 9. 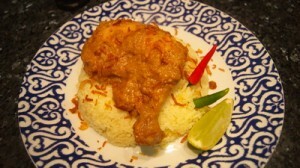 Check the salt and add green chillies, sugar, sultana and cashew nuts and gravy becomes thick. To make gravy thick cook 5-8 minutes without lid. 10. Fry the rice with all spices except green chillies, salt and sugar for 6 minutes. 11. Add green chillies, salt, sugar, milk and water rice. Cook rice 10 minutes on high heat and l0 minute on low heat. 12. Take a serving bowl and serve rice, chicken and fried onion (don’t mix it). 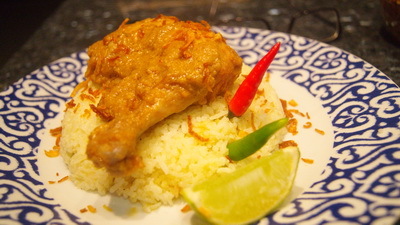 Enjoy hot Murg Polau / Morog Polau / Chicken Pilaf. Tips: 1. You can use ghee or oil more or less or make only with ghee which will make tastier Morog Polau. 2. I prefer to use cashew nuts powder. 3. Please use fresh green chillies. Thanks for sharing the recipe. What is sultana? Where do i get it? Most welcome. Sultana means dry grape(kismis). it is available in every supermarket. it would be very heipful.. Thanks for the recipe. Is polau rice the same as kala jeera recipe? yeah you can use kali jeera rice too . Thanks.